After leaving Dunhuang, we arrived in Xi’an (西安 xī ān – western peace) – the capital of Shaanxi province, it has over 3000 years of continuous history and is now home to about 8 million people. Its name has changed a lot over the centures; it was mostly known as either Chang’an (长安 cháng ān – long peace) or Xijing (西京 xī jīng – western capital) until 1369. The biggest attraction in Xi’an is the Terracotta Warriors but it’s so hard to explain the immensity of the relics there I’ve decided to leave that for another time. On our first afternoon we visited the Big Wild Goose Pagoda (大雁塔 dà yàn tǎ) in the Da Ci’en Temple (大慈恩寺 dà cí ēn sì) complex, which was right next door to our hotel. A famous Tang dynasty Buddhist monk named Xuanzang travelled to India and brought back Buddhist holy texts and relics. The Pagoda was built in 652 to house these relics; five stories were added in 704, and three lost during an earthquake in 1556. Today the pagoda stands 7 stories tall. The temple complex is quite large, though only a fraction of its earlier size, with a small monastery attached. I chose not to climb the pagoda, instead wandering through the lovely gardens. Big Wild Goose Pagoda in Da Ci En Temple complex. Every night there is a 30 minute long show of synchronised lights, fountains, and music, on the stepped mall outside the Big Wild Goose Pagoda. I saw the show with my family in 2004, and my sisters gleefully joined scores of Chinese escaping the incredible midsummer heat by playing in the water. Lots of people were playing fountain roulette – two people stand with a foot half over a fountain jet, each hoping theirs will spray water on the other first! Ten years later, security guards with whistles positioned around the mall stopped onlookers from doing this, and were also partly successful at stopping people entering the fountains to have photos taken. Nonetheless it was still quite the experience. The music switched between well known classical/ballet music (the 1812 Overture, for example, and pieces from Swan Lake and the Nutcracker suite) and traditional Chinese tunes. 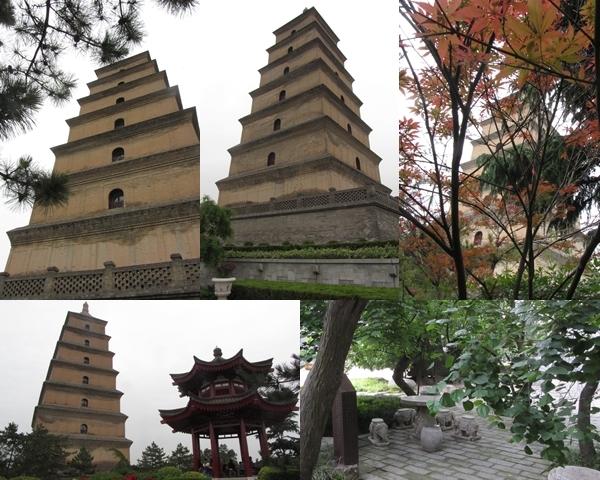 The following morning we visited the Drum Tower (鼓楼 gǔ lóu), which dates to 1380. We arrived in time to take a quick look around before the drum show began. A group of 6 percussionists performed three pieces, using drums, cymbals, and even a gong. It was far more enjoyable than I expected, dozens of Chinese tourists in fluro orange vests and caps notwithstanding. From there we walked through the markets to the Great Mosque of Xi’an, a quiet space surrounded by narrow alleys full of souvenir stores. 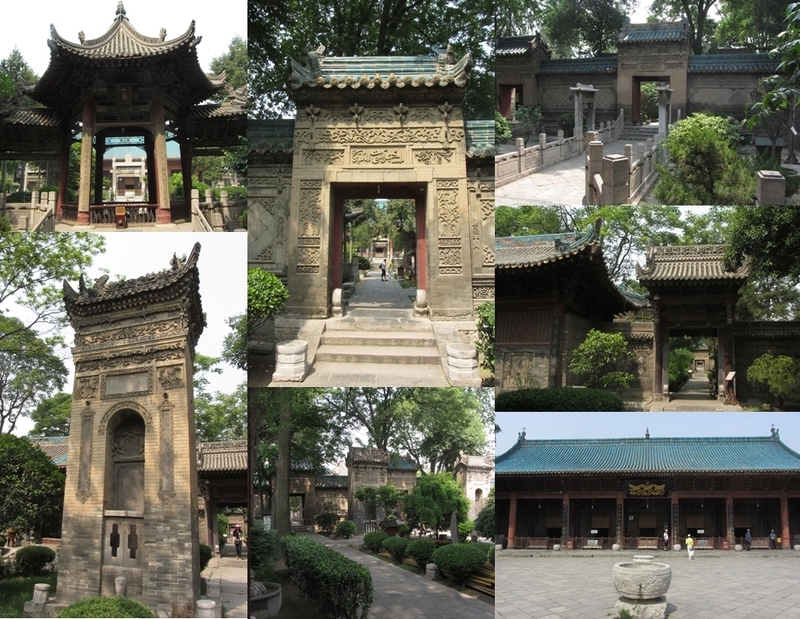 It was one of the earliest mosques in China, founded in 742 – although it has been extensively renovated since then. It is surprisingly Chinese in design and architecture, with no minarets or domes. Until you look closely at inscriptions, including a few in Arabic script, it looks much like any Chinese garden complex – with long walkways and vistas through stone and wood gateways, and a long, narrow construction leading toward the prayer hall at the back of the complex. The mosque still operates as a place of worship; there was a ceremonial washing room with a sign politely asking tourists not to enter. A similar sign barred entry to the prayer hall but I watched as two muslim tourists were invited in. One had stopped at one of several stone water basins to ceremonially wash his feet, hands, and face, before removing his shoes and entering the prayer hall. His companion hung back until two men seated by the door (who obviously work there) invited him to enter as well. We made our way back through the narrow alleys into the pedestrian street markets, where stores selling touristy knick knacks (such as the two hair chopsticks I bought) were surrounded by lots of amazing street food. Between us we tried spiced baby potatoes; semi-sweet date cake on a stick; nuts and dried fruit; and watched noodles being fresh made on the street. I was fascinated by the “salt and pepper walnuts” being made and sold all over, but not enough to try them. We eventually stopped outside a Xinijang restaurant, where I saw pilau being made in huge pans outside – a sort of fried rice with carrot and lamb. I was drawn like a magnet to this dish, which I hadn’t eaten in years. 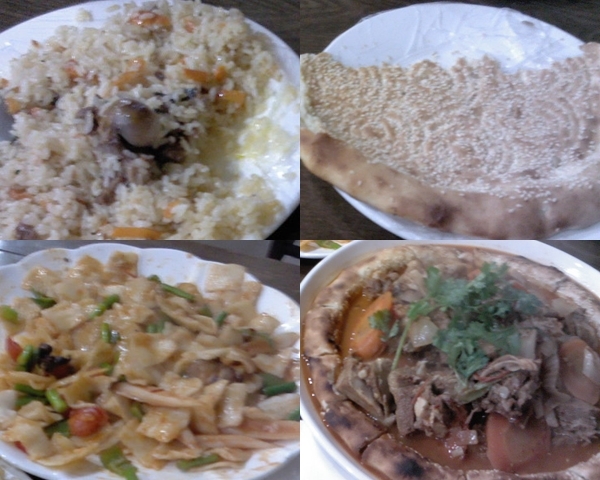 We went inside and I ordered old Xinjiang favourites – dishes I ate regularly during my first year in Beijing. The baked bread was salty and perfectly crusty; the nang bao rou was sublime, nang bread soaking in a thin and lightly spiced gravy, the lamb so tender it fell right off the bone. The staff were clearly Uighur and that seemed to be the language they and most of the customers were speaking. Most of the women wore some sort of head covering – hijab or al-amira, mostly, but there were two young women in chador and one woman had made a niqab-like face-covering with the way she wound her headscarf. On the way out there was more to look at – a 7 foot tall pile of baozi steamers; huge piles of tripe and offal for sale; more souvenirs and snacks. We bought some of the latter – several flavours of green bean cake and a freshly cooked zhi ma qiu generously filled with warm red bean paste. Eventually we emerged from the colours, sounds, and smells of the muslim quarter markets and out onto the busy street. 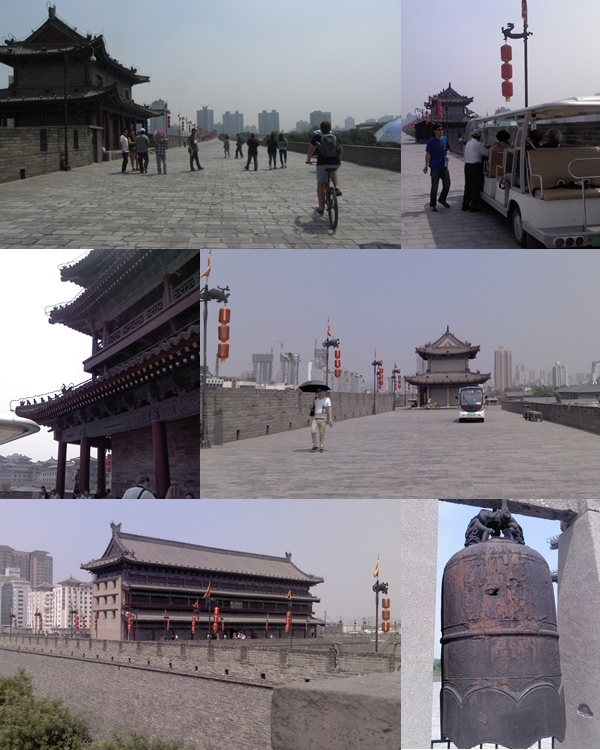 Our next stop was the South Gate of the Xi’an City Wall (西安城墙 xī ān chéng qiáng) where we got tickets for the sightseeing cars – electric carts, like a stretch golf cart, seating 15 people. The carts take more than an hour to make a full circuit of the wall, including a 10 minute stop at each of the East, North, and West gates. It’s hard to convey the scale of the city wall, in words or pictures. It was first built 2200 years ago, but the current wall (with similar measurements) was built in 1370; it’s nearly 14km long (8.5mi), 12m high (40ft), and 15-18m thick (50-60ft). The corners are far enough apart that one corner tower faded into the background before we reached the next. Originally there were small towers and buildings at regular intervals around the wall – each exactly two bowshots from the other, so that every spot on the wall was within safe bowshot. Some of these have been reconstructed, and at least one is currently under construction. There were red lanterns hung the whole way around – every few metres was another light pole with a length of lanterns hanging from it. On our last night we went out to find a drink and a snack at ended up at an overpriced bar where we met an interesting man – a musician originally from Britain, he had lived in Sweden before settling in Germany, and was 3 weeks into a 10 week stint working with an orchestra in Xi’an. He is a conductor and clearly enjoys his work greatly, although he was missing his wife, a freelance opera singer working in Germany. He mentioned nearby back street food places an Italian viola player in the orchestra (the only foreign musician, it seemed) had introduced him to. We decided to all go there, and spent an enjoyable evening talking over cold(ish) beer and skewers of chicken wings, spiced lamb, potato slices, and a tray of enoki mushrooms. It was very pleasant, but I soon found my “wall” approaching and was ready to hide away and get some much needed – and much enjoyed – alone time. All in all it was a great few days in an interesting city.